To register for Reunion @ Meliora Weekend please click here! A former airborne infantryman and fire team leader in the U.S. Army, Forsythe was inspired to seek a career in nursing after a life-changing experience during his 2009 deployment in Afghanistan. 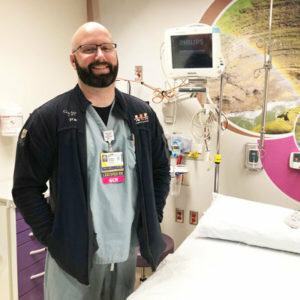 Currently pursuing his master’s degree in healthcare administration, Forsythe serves as an assistant nurse manager in the Pediatric Surgical Center at Golisano Children’s Hospital.